Buy "Creating a Data-Driven Organization," by Carl Anderson, who explains the analytics value chain you need to adopt when building predictive business models. What does it mean for an organization to be data-driven? Many organizations believe that because they generate a lot of reports, they are data driven. However, even if the reports are well structured and tell a great story (most don't), they are distinctly backward looking. They may state that a sales dip happened last week but, crucially, they don't say why it happened or what to do about it. Moreover, if the report sits unopened in an inbox or on unread a desk or, worse, opened and ignored, the report delivers little to no value to the organization. The situation is similar with dashboards. Like reports, they’re usually backward looking (though closer to real time); they often lack context; and they’re prone to feature creep, becoming cluttered with more and more metrics over time. It is rare to see a dashboard or report that paints a clear picture of what should be done to confront the challenges and opportunities facing a business. I should stress that reports and dashboards are extremely valuable to all data-driven organizations. My caveat is simply that these are not sufficient to define data-drivenness. A data-driven organization must, at the very least, be involved in more forward-looking analysis. This is where the why, the who, and the “what next?” questions should be answered. Analysis provides more context and should make, with supporting evidence, recommendations about next steps. The most forward-looking analyses are those that are predictive, that optimize, and that run "what-if" scenarios and simulations (these are the highest of Jim Davis’ levels of analytics). However, analyses can suffer the same fate as reports and dashboards. If they are unread, ignored, and don’t change the business, they haven’t driven anything. The analytics value chain. In a data-driven organization, the data feeds reports, stimulating deeper analysis. Analysis is placed in the hands of the decision makers who incorporate them into their decision-making process, influencing the direction that the company takes and providing value and impact. Figure from Brent Dykes. The hallmark of a data-driven organization is an effective “analytics value chain.” This is how data collection and reporting are transformed into insights and recommendations through analysis and, crucially, these insights and recommendations are used by decision makers to make effective, informed decisions. The analytics value chain is an iterative process: it leads to a change in the business (although the best decision may be to do nothing), the impact is measured, and information is fed back through analysis. This may sound trivial — that the analysis augments a decision maker leading to action and value — but it is not. In many cases, the data stops at HiPPOs (Highest Paid Person’s Opinions). These are the know-it-alls who, almost on principle, ignore the data, ignore the evidence and recommendations, and do what they want because they know best (after all, their paycheck proves it!). That’s fine if their gut is correct and their strategy works well. However, in most cases, it doesn’t. Moreover, in many organizations, there is a complete lack of accountability. They get away with it because they can’t be challenged. “Presenting data that decisively demolishes the HiPPO’s viewpoint/agenda can be an invitation to be fired and blackballed at no small percentage of companies,” says one commenter. The key to having an effective analytics value chain — being data-driven — is completely rooted in organizational culture. You need to foster a data culture. This is a multifaceted problem that involves data quality and sharing, analyst hiring and training, communication, analytical organizational structure, metric design, A/B testing, decision-making processes, and more. Culture is the dominant aspect that sets expectations of how far data is democratized, how it is used and viewed across the organization, and the resources and training invested in leveraging data as a strategic asset. The foundation is the data itself. You need to collect the right data and collect the data right. That is, most data teams are resource constrained, with many requests coming in from the business. In partnership with the business units, they need to prioritize the best data sources to bring into the organization (the subject of a future post) while minimizing collection bias and maximizing data quality. That is easier said than done. The obvious primary consumer of the data is the analytics organization: the analysts and data scientists whose job it is to generate insights. However, rather than drop off a report or analysis on a desk, their job should be to ask and answer the right questions, that is, to be “business savvy,” and then sell their recommendations to the decision makers. To achieve that, they need the right skills, training, and support to perform well. They also need the right organizational structure to be effective. That often means being embedded in business units, sharing goals with those teams, tasked with moving the same top-level metrics but also supported by a central data team for training, mentoring, and setting standards. The other main set of data consumers is less obvious: everyone else! A data-driven organization should democratize data as much as possible, provide a broad swathe of staff with the data and skills they need to be effective, to embed data into their processes, and empower them to make appropriate data-driven decisions. Part of that group are the decision makers themselves. They should be data literate — meaning that they should have sufficient skills to judge good and poor experimental design, pushing back on analysts when necessary, to ask the right questions, and to interpret metrics and evidence appropriately. In a data culture, staff are bilingual: analysts speak business and the business speaks data. What does it look like in practice to be objective, to be anti-HiPPO? You’ll see a strong A/B testing culture, as this allows an organization to innovate, try out new ideas, and get direct feedback from real customers and users (it’s “the market speaking to you” says Scott Cook, founder of Intuit Inc.). Hypothesis generation is rewarded and, importantly, it’s recognized and accepted that anyone can generate a good idea. Finally, it is relatively non-confrontational, even to a HiPPO. You can say, “we don’t know the answer, let’s test it,” and let the data shine. 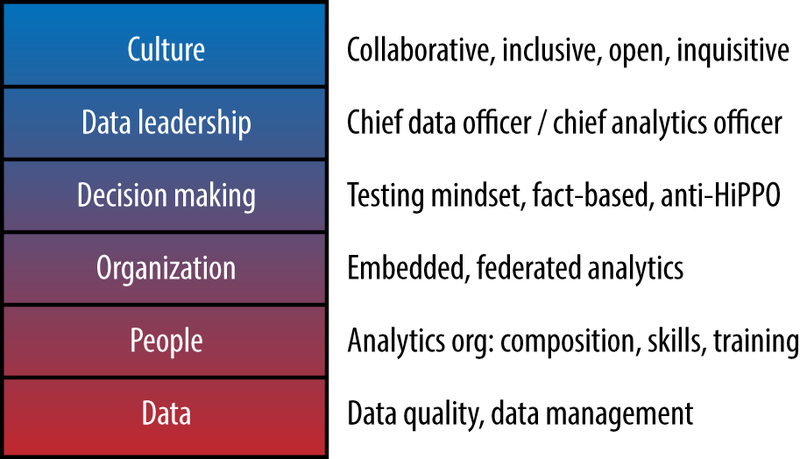 A final component is data leadership. You need someone, a head of data, to spearhead this culture change, to evangelize data as a strategic asset, and to drive concrete returns and wins. I would also argue, though, that in addition to such top-down leadership, the analytics organization has a pivotal role in enhancing and shaping the culture and organization for the better from the bottom up. This requires being more vocal, visible, and proactive. Cultural change is hard. The sooner you start, the earlier in an organization’s history you begin to bake in this culture, the easier it will be to become data driven. To learn more, buy “Creating a Data-Driven Organization,” by Carl Anderson, and register for our upcoming webcast, "Essential Elements of a Data-Driven Culture", Thursday, November 12, 2015, at 10 a.m. PT. This post is a collaboration between O'Reilly Media and Looker. View our statement of editorial independence. Article image: Loew's State Theatre, Providence, RI in 1929 - 4 (source: By CharmaineZoe on Flickr). Carl Anderson is the Director of Data Science at Warby Parker in New York overseeing data engineering, data science, supporting the broader analystics org, and creating a data-driven organization. He has had a broad-ranging career, mostly in scientific computing, covering areas such as healthcare modeling, data compression, robotics, and agent based modeling. He holds a Ph.D. in mathematical biology from the University of Sheffield, UK.